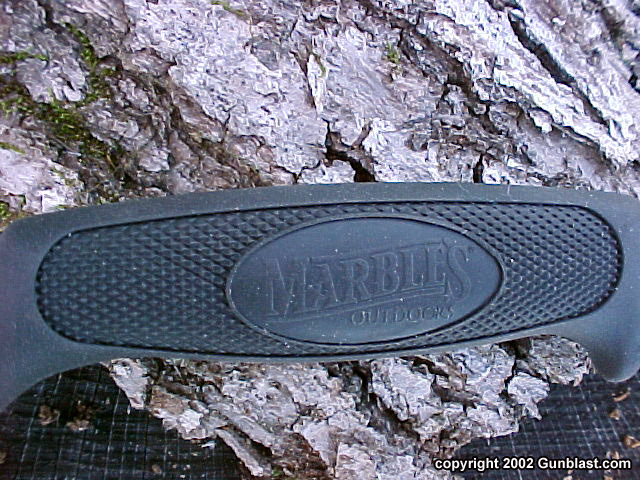 Marble’s is one of the better known names associated with hunting tales of years past. Stories of hunting camps and woodsmanship, of campfires and wool caps, and of iron sights and meat poles that were the glory days of hunting. Those were the days when the hunt was as much about the camaraderie of the hunters as it was about meat and trophies. In those days of the early twentieth century, the name of Webster Marble was well known around the hunting camp. Marble’s did back then, as they still do today, manufacture some of the finest quality practical rifle sights available, along with other products for the well-equipped hunter. Beginning around the year 1900, Webster Marble designed and manufactured some of the most practical and useful knives available to the hunters of that era. 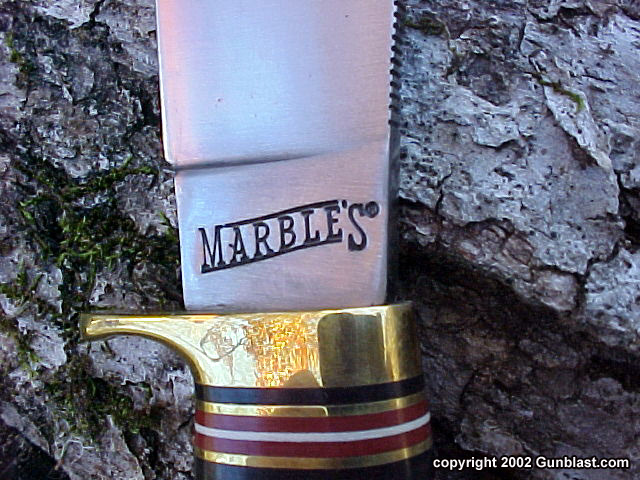 For many years the Marble’s name stood for quality cutlery for the outdoorsman, but sadly were discontinued in the 1970s. These knives were made from quality materials by real craftsmen, and are now both legendary and very collectable. A few years ago, Marble’s resurrected the great designs of their company founder and began producing their knives from superior materials on modern CNC machinery. Along with the classic fixed blade designs, they have also began producing a lock-blade folder of unique design. 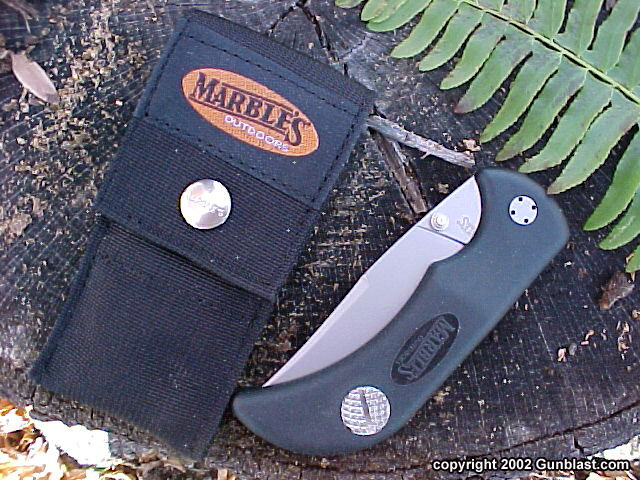 Starting with the folding knife, which Marble’s calls the Hunting Safety Folding Knife, we will look at three of their most popular designs. 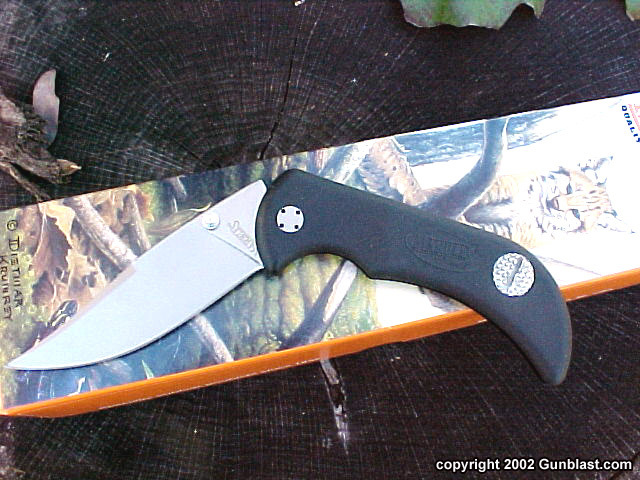 The Hunting Safety Folding Knife has a positive lockup with a release like none other. 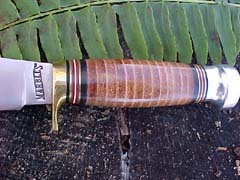 The four inch blade is of a useful design and manufactured of stainless steel with a durable synthetic handle material, but the unique feature of this knife is the lock release. The release is of a design that is virtually impossible to accidentally release, requiring the user to grasp the release with the thumb and forefinger while rotating the mechanism to release the blade. After a couple of practice tries, it becomes quick and natural to rotate the release and close the blade. The version tested has an overall extended length of 8 ¾ inches and is light enough for pocket carry, but comes with a black cordura sheath. 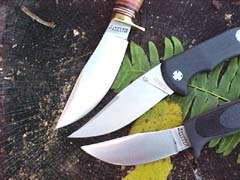 Moving to the fixed blade knives, we now will look at two of the best and most practical designs available for the hunter. These knives have classic Marble’s blade designs that are ideal for skinning, scraping, and butchering of large game animals. 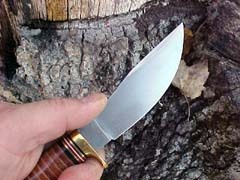 The Fieldcraft knife has a fixed blade of three and three-quarters inches and wears a synthetic grip material that Marble’s calls their Safe Grip. 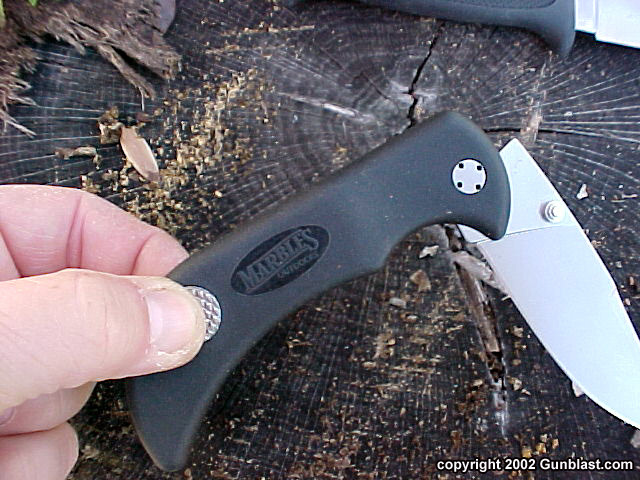 This is a durable black material that offers a positive and comfortable non-slip grip, and is quite possibly the best skinning knife on the market. All of Marble’s fixed blade knives are made from a high carbon steel for superior cutting and edge-holding qualities, and have a variety of handle materials available, but the Safe Grip is probably the most practical choice, and comes supplied with a quality cordura sheath. 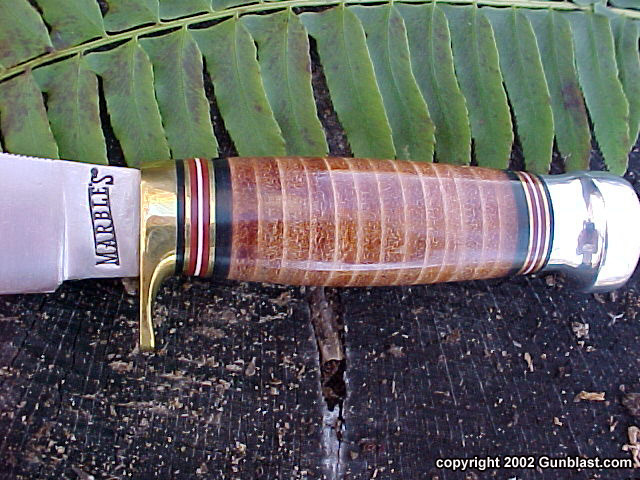 That being said, we will now look at my personal favorite of the Marble designs: the Woodcraft. 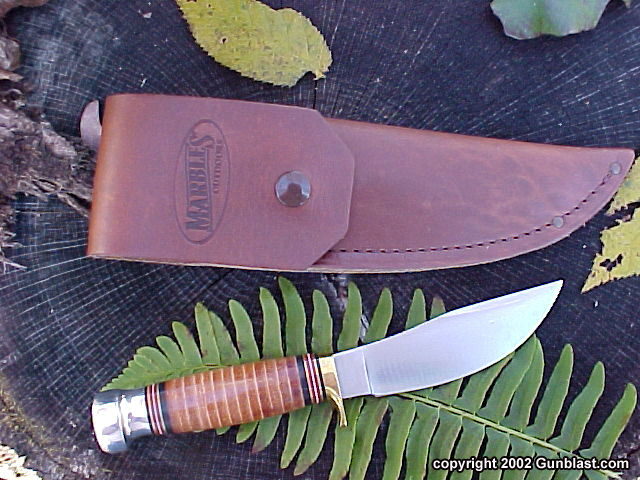 The Woodcraft is the knife that comes to mind when someone mentions a Marble’s knife. It is the classic Webster Marble design, combining a perfect blade with the classic stacked leather handle. The Woodcraft blade has a swept design with a generous belly for natural handling qualities, and has a built-in match striker on the back of the blade that is a perfect place for the thumb. The Woodcraft with the leather handle is both practical and beautiful. It comes supplied with a leather sheath that offers complete coverage for the blade and handle, along with a synthetic liner to protect the leather from the sharp blade, and the blade from the corrosive effects of the leather. While the Woodcraft is also available with the other handle materials, the stacked leather just looks and feels so right on this knife. The steel that Marble’s uses on these classic designs has the superior qualities that one really needs on a knife that is to be used by a hunter. These blades are made for cutting and skinning, hold an edge better than most competitive brands, and are easily resharpened when needed. While there are admittedly many knives on the market that will remove the skin from a whitetail and cut meat into small pieces, there is something very satisfying about using a quality knife of classic design. 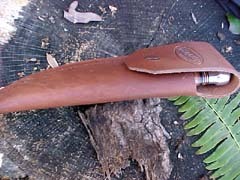 The carbon steel blade and leather sheath and handle add an element of nostalgia to the hunt, much like using a classic lever action or falling block rifle. 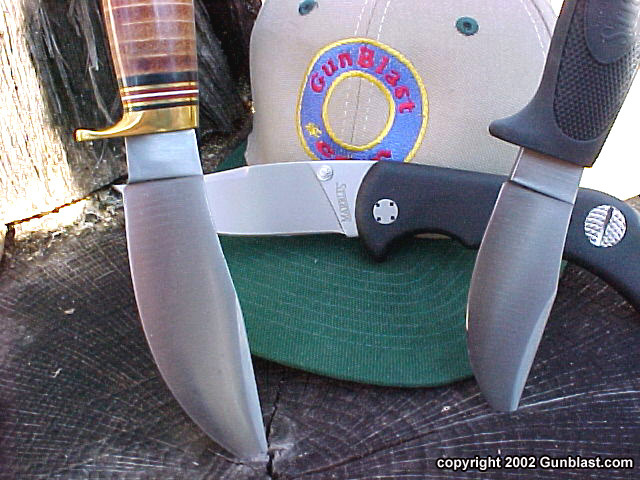 These knives are, while offering superior edge qualities, a kind of connection to the hunting camps of years past. 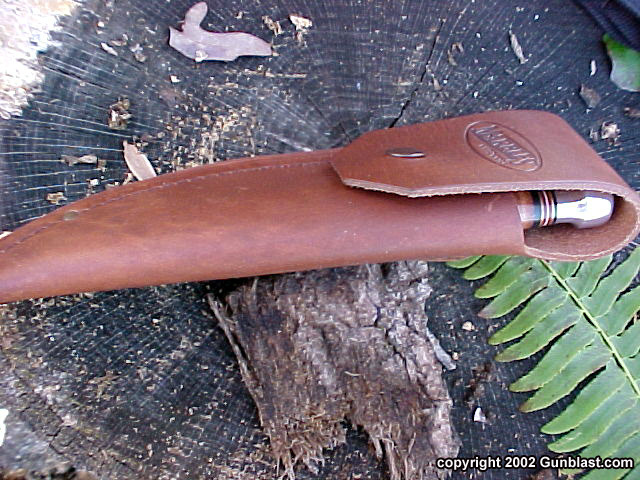 Maybe this is why, of the three knives reviewed here, the leather-handled Woodcraft is my favorite. All three are finely crafted from superior materials. The Hunting Safety Folding Knife is the handiest, the Safe Grip on the Fieldcraft is the most practical, but the Woodcraft with the leather handle is the most enjoyable; even to just hold in the hand and look at. There is something really special about these Marble’s knives that exceeds the sum of their parts. They are not only fine tools, but carry an intangible pride-of-ownership quality that is sorely missing in today’s world. 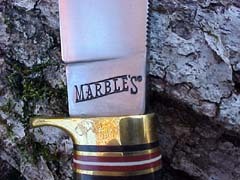 Marble's, one of the most respected names in sights and hunting gear, is once again making fine-quality knives. 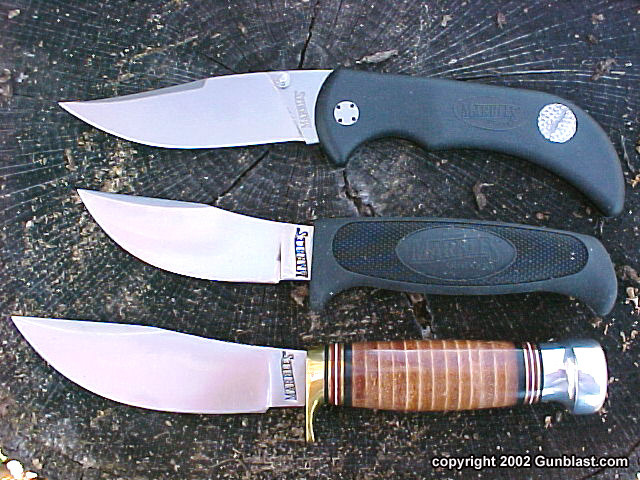 Marble's knives tested by the author include (top to bottom): the Hunting Safety Folding Knife, the Fieldcraft knife, and the Woodcraft knife. The array of knives tested cover a broad range of field & hunting applications, exhibiting quality design, materials & craftsmanship throughout. The Hunting Safety Folding Knife will appeal to many users, and is easy to carry either in a pocket or in the supplied Cordura sheath. This lightweight knife features a 4" Stainless blade, one-handed opening and a unique (and very safe) unlocking mechanism. The Fieldcraft knife features Marble's "Safe Grip" synthetic handle, Cordura sheath, and a very well-designed high-carbon steel skinning blade. 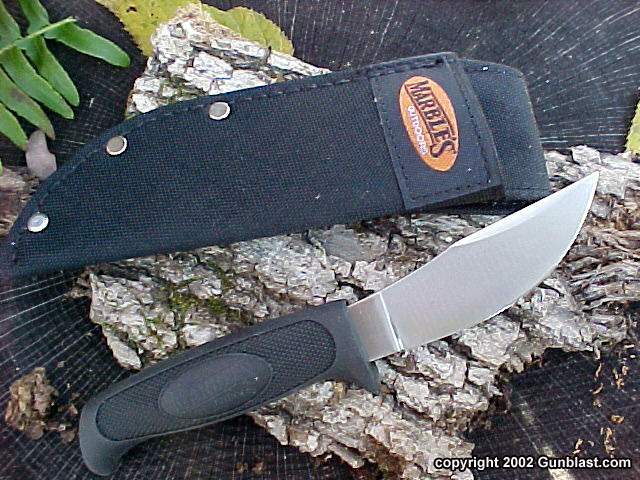 Jeff considers this to be one of the best skinning knives currently available. 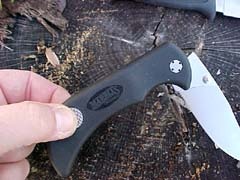 Author's favorite among the knives tested was the Woodcraft knife. Featuring a high-carbon swept blade with a generous belly (much like the Quinn boys! ), a full leather sheath and a classic stacked leather handle, the Woodcraft is the knife that comes to mind when someone mentions a Marble's knife. For camping, hunting, skinning, or just plain admiring, the Marble's Woodcraft knife has few equals.